Description: A collection that forms a part of the new emerging trend within ceramics known as “Soft Expression”, characterised by a serene and tranquil vision of ceramics. INTUITION is a subtle and elegant collection, designed with pastel hues and soft, neutral, pale tones with a faded effect. The colours, White, Sky, Aquamarine, Sand and Amber, present a watercolour appearance within the INTUITION series. 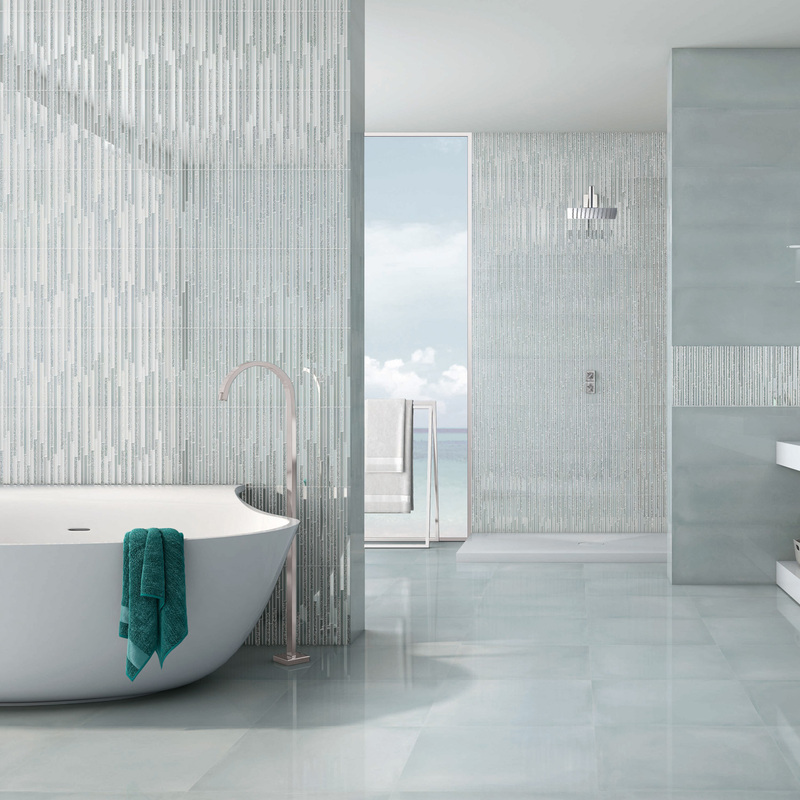 It is available in 30×100 format, rectified white-body tiles with a gloss finish, offering a plethora of decorative possibilities, it appeals to a broad range of tastes, enabling the creation of unique spaces with a personal touch. Combining these wall tiles with wooden and stone flooring is a mainstay of architecture and interior design, and it can also present a uniform and integrated look when combined with its coordinated paving, available in 47.1×47.1 format, also rectified, in Sky, Aquamarine and Amber. The fusion of hydraulic cement and watercolour effects, a new three-dimensional relief and a polished finish amongst its decorative complements bring the natural aspect of the materials to the fore, making the INTUITION collection an assured success. Via this collection, in IBERO, we hope to create warm and welcoming environments for a timeless and avant-garde market.